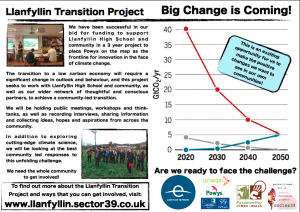 “Big Change is Coming” – New Leaflet Launched! 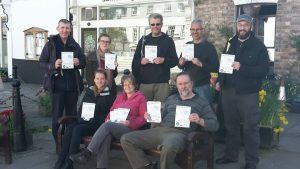 On Saturday afternoon, April 22nd 2017, members of the Llanfyllin Transition Project team and recent Sector39 permaculture graduates from Chester and Reading launched a new leaflet in Llanfyllin in celebration of Earth Day and in solidarity with the global march for climate science. 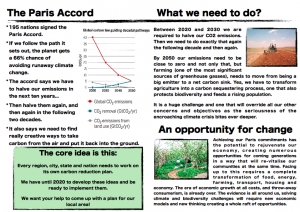 The leaflet gives some basic information about the Paris Climate Agreement, which we feel is a great incentive for local communities to come together to plan their own futures. 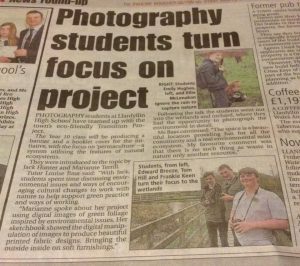 In other news, we were extremely pleased to see that the Advertizer (April 18th 2017, p. 18), featured a short write-up about our work with photography students at Llanfyllin High School. We are really looking forward to seeing the images that the students produce to communicate the need for a cultural shift towards ecocentrism if we are going to meet the challenge of climate change!